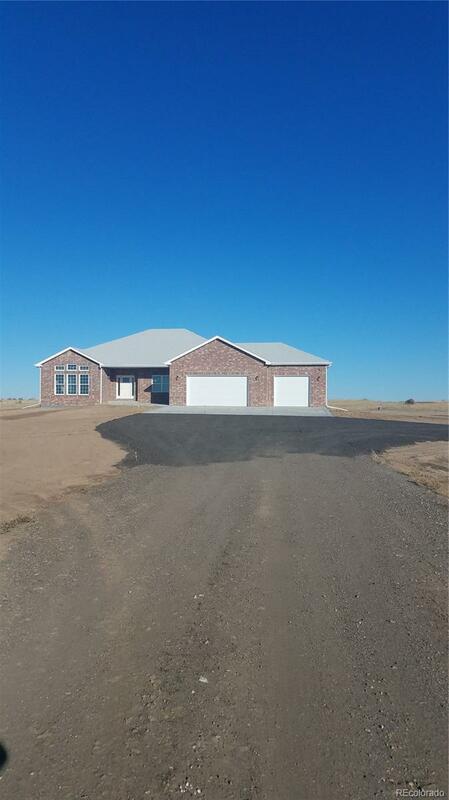 Brand new all brick ranch home on 10 acres zoned ag2 with NO hoas. Fantastic open floorplan., gigantic covered patio on the east side off the kitchen and the master. Great place to put a hot tub . amazing sunsets, bring the toys or horses..Private office with French doors, Great lighting with lots of windows. Huge master to die for with walk in closet for royalty. Soaking tub and 5 piece. Washer dryer outside master. 3 gar garage with long driveway off the road for privacy. Fenced on 3 sides. All new stainless appliances, large covered patio off the kitchen . Egress windows in massive open basement basement ready for your ideas. 2 40 gallon hot water heaters.Upgraded quiet garage door with remotes. Fibre optics in the street ready to connect to Eastern Plains. Tile, hardwoods ,granite, Hickory Cabinetry It is ready The great room is perfect for entertaining!! !